Just when we thought that the Philippines couldn’t get any prettier after having spent two weeks exploring deserted beaches and waterfalls, we made our way to the north, heading towards the rice terraces of Ifugao, where we planned on going on a Banaue rice terraces tour. We had heard great things about this part of the Philippines and the connection from Manila to Banaue seemed pretty decent, accommodation in Banaue was plentiful, so we were looking forward to having a great experience. Actually, it didn’t start off that well. The buses from Manila to Banaue were full on the day we planned to go. They were also fully booked for the following ten days, so we had no option but to carry out some research on how to go to Banaue rice terraces indirectly. We decided to go to Baguio and make our way to Banaue from there. We commuted from Baguio to Banaue via overnight bus to arrive on a dull rainy morning and it was anything but pretty, so we were left wondering whether the Banaue rice terraces tour was worth all the hassle we were going through just to get there. Luckily our accommodation in Banaue was not far from where the bus stopped (and a free transfer service to the guesthouse is offered by the tourist office), and after having done some research about the area and learnt some facts about Banaue rice terraces, we realised that it was perfectly possible to go on our own independent Banaue rice terraces tour without a guide. Glad to realise that this would save us some money, we succumbed to sleep. Our sleep was cut short after only a few hours, when the sound of horns and festivities rudely woke us up and we rushed out to see what was happening. 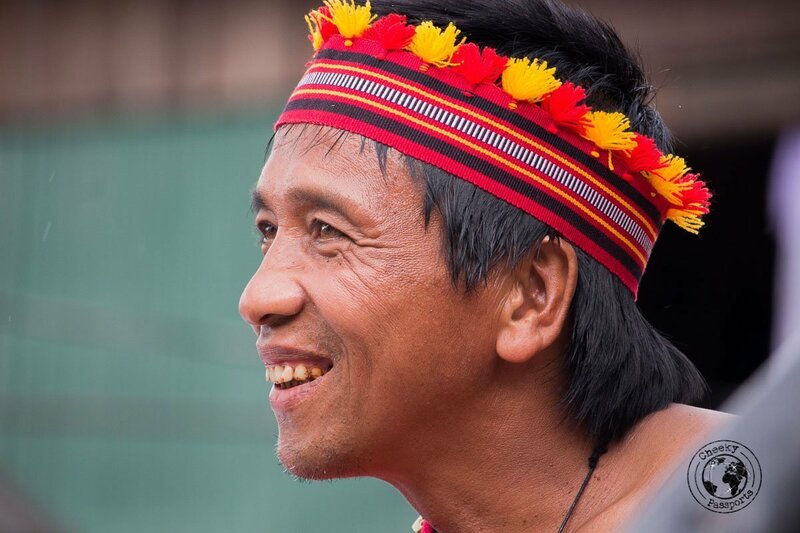 We were told that it was the third day of an important festival taking place in Ifugao and that we were very lucky to be here during this time of year to witness it! We were delighted to realise that this would allow us to experience other activities in the area besides the Banaue rice terraces tour, and that our accommodation in Banaue was perfectly situated so that we could observe the festivities from our balcony ! Check the latest accommodation prices in Banaue on Hostelworld, Booking.com or Agoda. 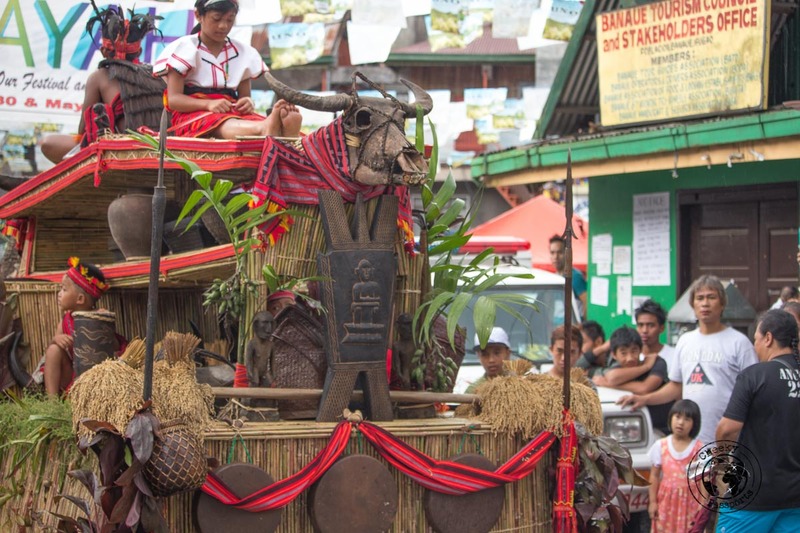 Although very interesting, the festival was not the highlight of our trip to Banaue. We were there for a Banaue rice terraces tour, for an insight into the 2,000-year-old terraces that were carved into the mountains of Ifugao in the Philippines by the ancestors of the indigenous people. It is worth noting that when people refer to the Banaue rice terraces, they usually mean the rice terraces in Banaue proper as well as those in the surrounding areas such as Batad, collectively referred to as the Banaue rice terraces. When we arrived in in Banaue, we realised that the rice terraces of Banaue are pretty but those in Batad are spectacular. Banaue and Batad are located in the province of Ifugao, one of the provinces in Cordillera Central, a large mountain range on the island of Luzon. The Cordillera mountain range is home to several ancestral tribes of indigenous mountain people each with its own particular tribal culture. The easiest way to get from Manila to Banaue is by overnight bus. There are 1-2 trips per day which are often fully booked, so booking early is highly recommended. There are also lots of private charters and tours running from Manila to Banaue but we found these to be overpriced and not worth considering. You may book busses online using services like 12Go Asia. All buses from Manila to Banaue were full booked the week we wanted to go. After researching how to go to Banaue rice terraces from various other destinations, rather than directly from Manila, we realised that our best options would be to go from Baguio or Sagada. All the buses from Sagada were also full for the following days, but happily we saw that the overnight bus from Baguio to Banaue a couple of days later was not, hence our best option was to go from Manila to Baguio, spend a couple of nights there, then catch a bus running from Baguio to Banaue. When making travel plans, it is very important to consider that there is a lot of internal Filipino tourism during weekends. This particular weekend happened to be a long weekend too, so most buses were booked out weeks before, making it very difficult for us to move from Manila. If you’re in Banaue during the Imbayah festival, you’re in for quite a show! The three-day festival is based on the old ritual depicting the ascendancy of a commoner and his family to the ranks of the elite. 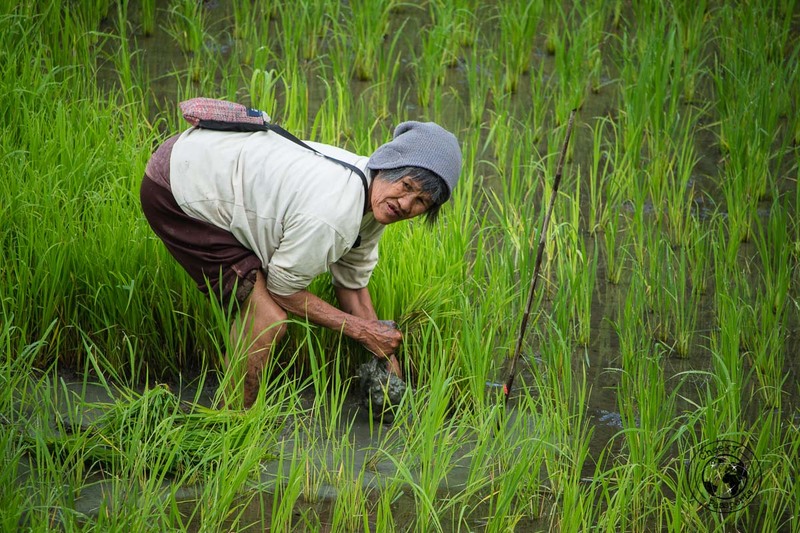 It also celebrates rice planting and the harvest and rice wine. 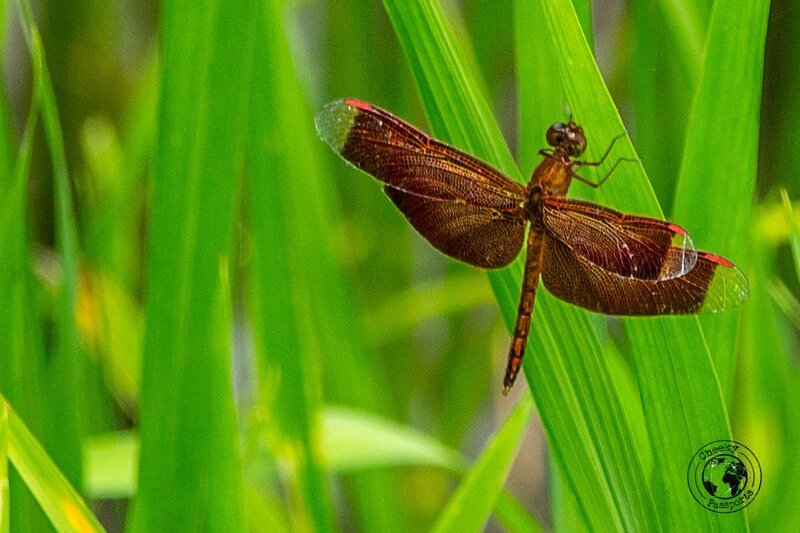 A great spectacle to experience before or after your Banaue rice terraces tour! We were in Banaue on the last day of the festival just in time to witness the street parade where villagers from neighbouring barangays (districts) walked by showcasing their traditional clothes. Later, we joined the people on the streets waiting for the colourful floats to pass by before they “parked” in the public market square which had been cleared out for this purpose. 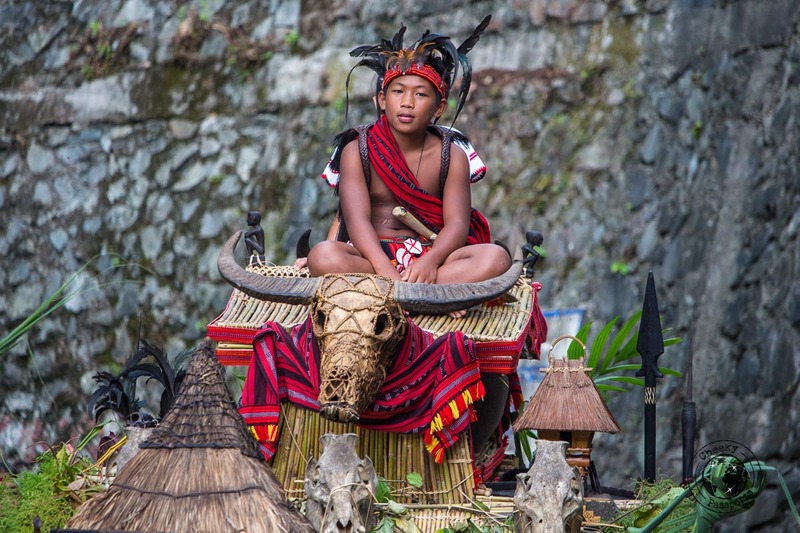 The festival is one of the most important in the region and typically showcases different tribal dances and games from the Ifugao region. We would have loved to have been able to watch the festival from the start! Banaue is a little village (two roads) lined with some guesthouses, restaurants and bakeries catering to those travelers going on a Banaue rice terraces tour. Accommodation in Banaue is mostly geared towards backpackers and is normally affordable and not difficult to find. You should know that although the rice terraces in Banaue are beautiful, those in neighboring Batad (normally included on a Banaue rice terraces tour) are spectacular. The Cordillera mountain range is dotted with rice terraces. You can see them from the buses, jeepneys and vans as you travel between one region and the other. 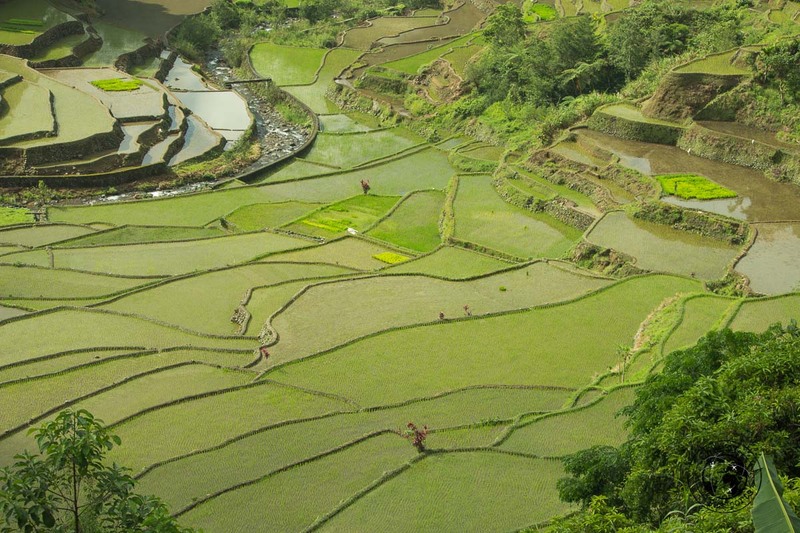 The Rice Terraces of the Philippine Cordilleras have been inscribed as a UNESCO World Heritage Site. 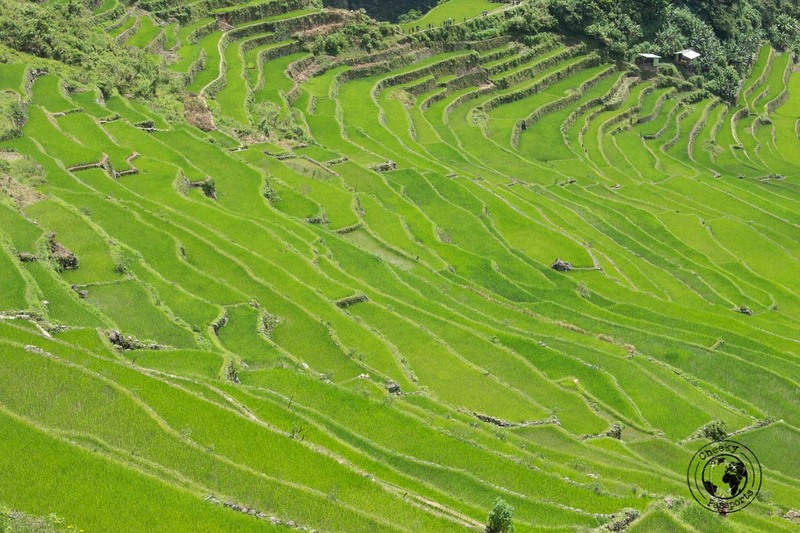 These include the Batad Rice Terraces, Bangaan Rice Terraces (both in Banaue), Mayoyao Rice Terraces (in Mayoyao), Hungduan Rice Terraces (in Hungduan) and Nagacadan Rice Terraces. One of the little known facts about Banaue rice terraces is that those in Banaue proper (seen from the viewpoint in Banaue) do not have world heritage status. The Banaue rice terraces were carved most likely by hand by the Ifugao people, using very basic tools more than 2,000 years ago. 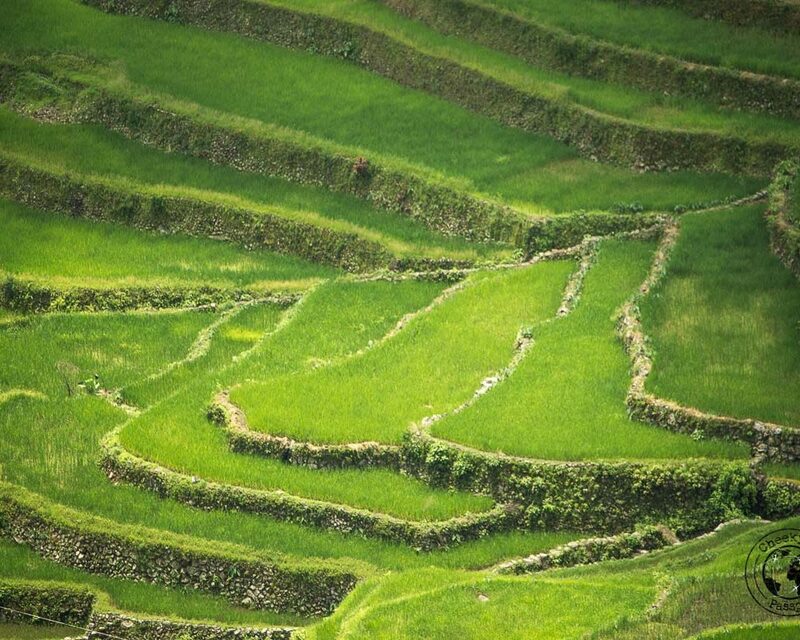 The Banaue rice terraces are located about 1,500 meters above sea level. Many Filipinos refer to the Banaue rice terraces as the 8th wonder of the world. 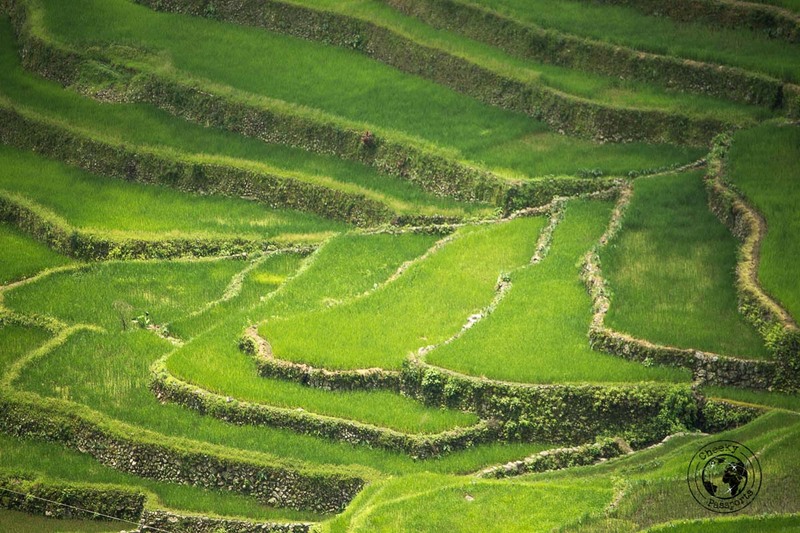 One of the curious facts about Banaue rice terraces is that if the combined length of the terraces were placed end to end, they would result in a distance equal to more than half of the Earth’s circumference. It is common practice to hire a guide for a full-day Banaue rice terraces tour, but this is not at all necessary and we managed a day trip on our own very easily. This was partly thanks to the directions posted by our fellow blogger Kathy in her blog post about a self-guided tour of Batad. It should be noted that the Banaue rice terraces in Banaue proper are very easy to see from the village at different viewpoints and very little hiking is actually required. We thought that the rice terraces in Batad are more beautiful than those in Banaue village, and again there’s no need for a guide, it is perfectly possible to get to Batad independently. which seems to be a standard price for this route. When we asked him (on the previous day) what time we should set off for our independent Banaue rice terraces tour, he suggested 8am and although we woke up a little grumpy thinking that it was too early to start our trek, we later thanked him for his advice since we had the terraces pretty much to ourselves for the first few hours we were there. It was raining as we set off from Banaue to Batad but it started clearing up as we approached Batad. There are three rice terraces viewpoints to stop at during your independent Banaue rice terraces tour, en route to Batad (make sure that you specify to the trike driver that you want to stop at the viewpoints as you negotiate the price). We had packed our rain jackets that morning, pretty sure that we would be getting soaked, but soon realised that what we really needed was sunblock and sunglasses – it was sunny and scorching hot in Batad! 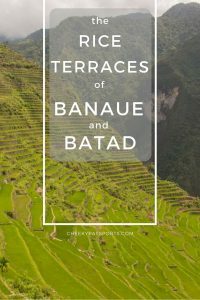 Our intention was to hike along the terrace of Batad until we reached the best viewpoint and carry on hiking to the Tappiya Waterfalls on our independent Banaue rice terraces tour. Unfortunately, when we got there we came across a sign which indicated that the waterfalls were closed due to upgrading works of the pathway leading to them, so we never got to do that part (Nikki breathed a sigh of relief here since the trek to the waterfalls is pretty arduous we had been told). The first part of the hike is downhill across a muddy track, leading on to a shack selling some snacks. Further downwards, there are some signposts indicating the route, but they are not easy to follow. You will never get lost though, since the rice terraces are right in front of you and it is not difficult to find a path across them. Keep in mind that the higher up you stay, the less arduous will the climb to the viewpoint be! It is pretty normal that you actually walk in and out of people’s houses and shops as you make your way to the terraces. These shops are strategically placed at the highest points of the hike so that you get to them just after you have sweated your guts out. You then get to walk right into and across the actual terraces to arrive to the best viewpoint where you can take in the beauty of the terraces just below you as you stand at one of the highest points. 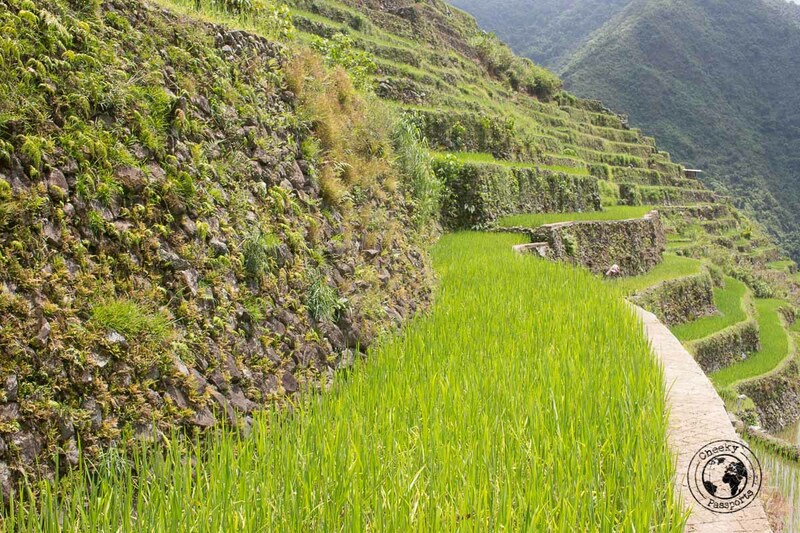 It is also possible to go on a multi-day Banaue rice terraces tour independently. We do suggest that you hire a guide for this one though since it will be easier to get lost if you’re trekking longer distances! We always promote independent travel, but if you’d like a little help, check the tours offered by Viator . The most convenient place to stay if you want to go on a Banaue rice terraces tour is in Banaue itself. Due to the festival, most places were full but we managed to secure a room at Koreen Guesthouse right in the heart of the village. Our room had a large balcony from where we could watch the festival and definitely scores 10/10 for location, although it did get noisy at times. Other amenities are good and the place is pleasant enough, so we would happily recommend this accommodation in Banaue! 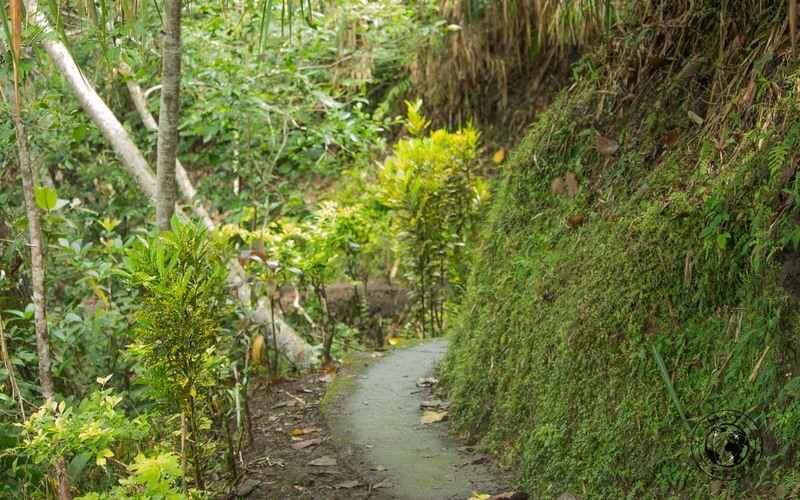 There are some ‘homestay’ type guesthouses in Batad among the terraces, but only consider staying there if you’re carrying very little luggage, you will need to carry them for a few km up and down the hills to get to your residence. Check the latest accommodation deals in Banaue on Hostelworld, Booking.com or Agoda. We were not impressed by the restaurants in Banaue. The popular People’s Lodge and Restaurant commands a spectacular view over the valley below (on the back part) but although the food was ok, the service was very poor. We had breakfast at the Las Vegas restaurant opposite; they had decent oatmeal, eggs and coffee at a very affordable prices and were open early in the morning (many other restaurants were not). The bakeries of Banaue on the other hand, serve delicious fresh cakes and pastries for 5-20 PHP (about €0.08-0.30) /piece! A very welcome treat after going on your Banaue rice terraces tour! 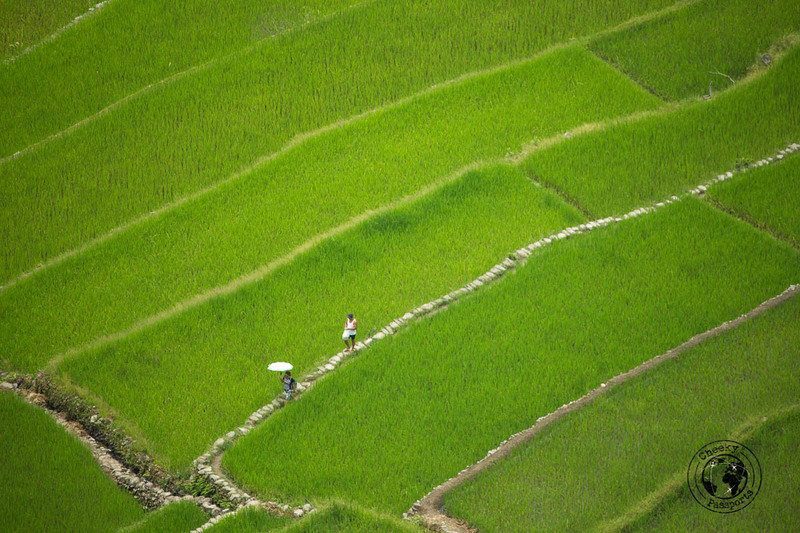 Carry water around with you if you’re on a Banaue rice terraces tour. There are shops serving cold drinks too but you will need constant hydration! Carry sunglasses and sunblock – we got pretty sunburnt during our hike! 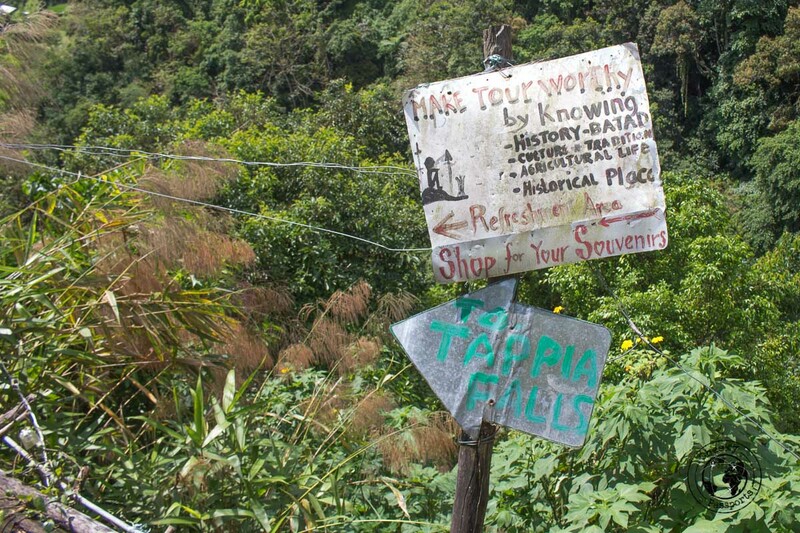 It is easy to hike in Batad without a guide, follow the directions in this link. You can get an early morning bus or a van (departing later in the morning) from Banaue to Bontoc or Sagada if you plan on exploring more of the Cordillera. Alternatively, you can go back to Baguio or Manila. Unless you plan and book ahead, you need to be as flexible as possible. it is very common to find that transportation to the region is booked or scarce and you need to be ready to change your plans if necessary. I am planning to go on a trip from Manila to Banaue – Sagada – Batad – Manila and i am trying to organize in advance. I want to book a tour cause my fiancee is not willing to take the overnight bus. Could you pls tell me how much was the tour per person and are there many tourguides doing it? Did you try to negotiate the price? Thanks in advance. Hi Milena, we did all the destinations independently, so it is difficult for us to advise re an agent, however there are plenty of tour operators from Manila doing these destinations. Nikki doesn’t like long bus trips either, but sometimes there is no way to avoid these! Even by private transport, be ready for a 12 hr ride. By the end of it, it will be worth the effort! Happy Travels! Hi can i ask which dates you went so i can see if we will be seeing the festival please?? it seems great! Hi, did you carry your passports with you all the time? is it possible just to bring a ID ( like drivers license ) and leave the passport in Manila? Hey Mai Mai, we did take our passports to Banaue since we typically carry them with us wherever we travel. We don’t remember needing to use them there though!